Throughout the history of jewelry making, metalsmiths have strived to perfect not only their artistry, but their materials as well. In this ongoing quest, innovative metallurgists have produced new white metals in an attempt to combine all the virtues of existing metals while eliminating all the disadvantages. Their goal was to create a metal that resisted tarnish and firescale, that was both malleable and durable, that had a pure white color, and that didn’t cost a fortune. The majority of these experimental alloys have been based on traditional alloy recipes with the addition of a few other elements. Most alloys gained some resistance to firescale and tarnish only to sacrifice the necessary malleability, or they added costs by requiring the metalsmith to buy new tools and buffs to prevent contamination. 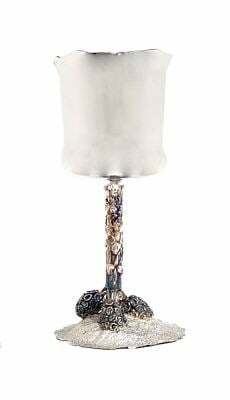 The base for this platinum sterling chalice by Charles Bennett resulted from a casting accident; a flask cracked, and a flashing of metal formed at the end of the main sprue. 6 1/2 in. (16.5cm) high, 3 in. (76cm) wide at the mouth. Platinum sterling has been tested with many mainstream metalsmithing processes and has performed with results similar to those of 14k yellow gold. While test versions of platinum-sterling solders are available, American Bullion Inc. (ABI) suggests using 10k white gold solders to match the color and tarnish resistance of platinum sterling. When used in casting and in fabrication, the platinum sterling showed no discernible firescale. Techniques such as milling, engraving, stone setting, laser welding, and electroplating all produced excellent results. 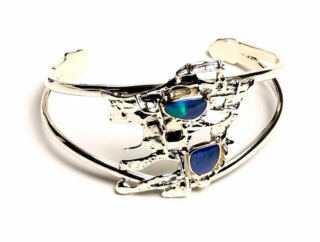 Platinum sterling shows no discernable firescale when used in casting and fabricating pieces such as this cuff bracelet with opals, by Charles Bennett. 3 x 2 in. (76 x 51mm). While platinum sterling’s rigidity would normally indicate a loss of malleability, this is not the case with this alloy. Ingots 6.5mm (1/4-in.) thick of the 3.5 percent platinum sterling have been milled to 28 gauge (0.32mm) without annealing and have shown no cracking or splitting at the edges. Platinum sterling will work-harden when pushed to deform or reduce in high percentages. For hydraulic-press, matrix-die, or roll-printing applications, annealing of platinum sterling is recommended in an oven set to 700C (1292F) for 20 minutes, followed by immediate cold-water quenching to gain the greatest malleability. Torch-annealing smaller pieces of platinum sterling to a pale rose-colored glow, then quenching them in cold water and briefly soaking them in pickle, resulted in adequately annealed metal for fabrication, with a clean surface exhibiting no firescale or oxidation. Keum-boo and reticulation, the two techniques in which it is necessary with traditional sterling to raise a layer of fine silver to the surface, have shown mixed results. While testers achieved keum-boo without the need to raise a fine-silver layer on the platinum sterling, they had no success with reticulation. The chemical elements in the alloy that allow the platinum molecules to bond with the silver molecules interfered with the heating and shrinking ratios needed for traditional reticulation to occur. For similar reasons, fusing is not advised with platinum sterling; fusing can cause other elements in the alloy to overheat and burn. Enameling also produced mixed results. While the renowned enamelist David Freda reported good results, others have found enamels on platinum sterling to look milky. The different results with enameling may be due to the vast diversity in the types of enamels and application methods employed. Other industries have been quick to adopt the alloy. 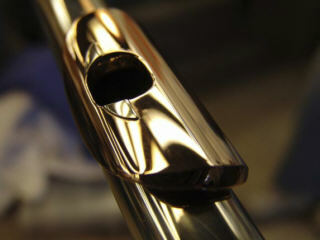 Williams Flutes uses platinum sterling in its mouthpieces, citing a purer tone. Photo courtesy of williamsflutes.com. Due to platinum’s greater specific gravity, pieces made of platinum-sterling alloys weigh slightly more than those made of traditional sterling in the same size and gauge. Platinum sterling also has increased rigidity; in the same gauge, platinum sterling is less deformable than regular sterling and actually shares more malleability factors with 14k yellow gold than with silver. Increased rigidity is also responsible for the metal’s greater durability when used in detailed work and gemstone setting. Cost is another point of difference; platinum sterling hits the middle ground, at a cost of approximately ten times that of traditional sterling, yet still (at the time of publication) a quarter of the price per troy ounce of 14k gold. With platinum sterling, there is no need to retool; standard tools and procedures, including tumbling, work well, although clean buffs are recommended for fine finishing. It is necessary to keep bench sweeps separate from other metals and to send scrap material solely to ABI for refining if you want to recoup the platinum costs. Stamping your finished platinum-sterling piece may be the most difficult part of working with this new alloy. According to current Federal Trade Commission (FTC) guidelines, only objects that contain 950 parts per thousand of pure platinum alloyed with other platinum group metals (PGMs) may be stamped platinum (Pt, Plat.). There are currently no guidelines for legally identifying platinum sterling as such, and this issue remains under debate in the manufacturing jewelry industry. At the time of publication, the Platinum Guild International (PGI), the public relations company formed by platinum mining concerns and manufacturers, is steadfastly lobbying for platinum in jewelry to remain pure, regardless of the benefits that other alloys may bring to the marketplace. Fortunately, while there are regulations requiring a minimum of disclosure, there are no regulations restricting disclosure of an alloy’s content. Therefore, many metalsmiths now working with platinum sterling are stamping their work with the traditional “925” or “sterling” stamps and then adding the “3.5%” or “5%Pt” stamp to indicate the platinum content. FINE SILVER alone is a very soft metal that can be easily bent. To strengthen fine silver, metallurgists alloyed it with copper. The alloy of 925 parts fine silver with 75 parts copper known as “STERLING SILVER” was standardized throughout Europe in the early Renaissance. Its naturally white color and reasonable cost make sterling the most popular metal on the market. But sterling silver has its drawbacks. While sterling has been known and used for centuries, tarnish and firescale (a blotchy purple-gray discoloration) have been the bane of jewelers and silversmiths for just as long. And, while sterling silver retains much of the softness of fine silver, making it easy to work (malleable), the softness reduces its durability. Faceted gemstones, with their hard, sharp edges, are known to cut through sterling silver mountings. Metalsmiths developed tarnish removers and special polishing procedures to temporarily remove the discolorations in sterling silver, but a different white metal alloy was needed to address the durability question. Enter WHITE GOLD. Developed in the mid-1800s as a response to the need for a more durable white jewelry metal, white gold is an alloy of naturally yellow gold and other white metals, such as zinc, nickel, and silver. White gold has the benefits of durability and resistance to tarnish and firescale, but it is brittle and requires a plating of platinum or rhodium (a platinum-family element) to look truly white. Once the plating wears off, allergic reactions may occur and a light, naturally yellow tint shows through. White gold, in various reformulations, is marketed as an affordable alternative to platinum. But, with its cost as high as that of yellow gold and its significantly reduced malleability, white gold isn’t the metal of choice for most artisans. PLATINUM has been a known element since the time of the Egyptian pharaohs, but the technology needed to refine and work with it wasn’t available until the Industrial Revolution. A strong, naturally white, hypoallergenic metal that doesn’t tarnish or firescale, platinum has a dense molecular structure and offers high malleability – attributes that make platinum a durable and versatile jewelry metal. The fine lacework platinum filigree of the Edwardian period is a testament to platinum’s excellent malleability. However, platinum’s high melting temperature makes normal jewelry techniques such as casting and soldering difficult, while its rarity and weight make it cost-prohibitive to consumers and artisans alike. Thoroughly mix 1 quart (946 mL) of methyl alcohol with 11 oz. (325 mL) of powdered boric acid. Then mix 2 parts of the alcohol-boric-acid solution with 1 part Battern’s liquid flux. Coat the pieces to be soldered with this flux mixture, and ignite the flux for complete adhesion. Use a small artist’s paintbrush to add extra flux mix to the areas to be soldered. Sparex pickle is recommended. Keep pickling times to under 10 minutes. Fabuluster, a sulfur-free polishing compound, on clean muslin buffs is recommended. Tumble-polishing is highly effective as well. Keep ultrasonic cleaning to a minimum, as white streaking can occur. Steam cleaning is highly effective.